About 1,500 residents and some 6,000 employees of nearby businesses were ushered out of the southern end of town, a city official said. Most of the evacuated dwellings consisted of trailer homes interspersed among industrial plants, warehouses and a stockyard along a stretch of the riverfront known as "the Bottoms." Missouri River flooding was triggered by last week's "bomb cyclone" storm, which has killed at least four people in Nebraska and Iowa, left a man missing below Nebraska's collapsed Spencer Dam, and inflicted an estimated $1.5 billion in damages in Nebraska. Water entering the reservoir from that storm marked the most ever measured there since recordkeeping began 120 years ago, said John Remus, chief water manager for the Army Corps' Missouri River basin. The downstream flow also broke flood stage records at three locations along the river. 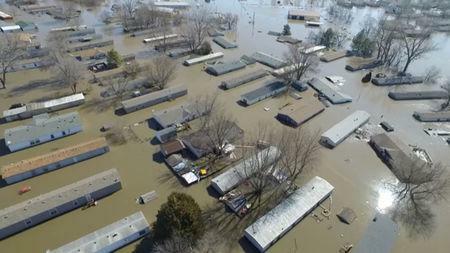 "For the most part, the city of Atchison is much more fortunate than some of the other communities along the Missouri River," the city's assistant manager, Justin Pregont, told Reuters. Still, floodwaters were threatening a handful of properties and roads along the riverfront in the community of 10,000, he said. 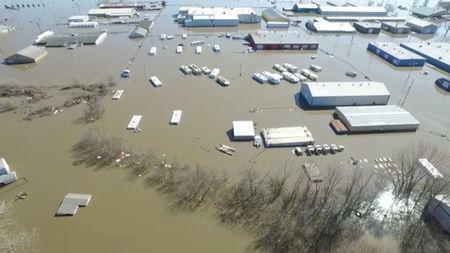 President Donald Trump on Thursday approved a disaster declaration for Nebraska, making federal funding available in nine counties that had born the brunt of last week's floods. "This is shaping up to be a potentially unprecedented flood season, with more than 200 million people at risk," Ed Clark, director of NOAA's National Water Center in Tuscaloosa, Alabama, said in the agency's spring outlook.